There is a large misconception that vegans can’t be athletes as they don’t eat the right food, that they are weak and that you basically need meat to be strong. If you do a quick google search you will find that this is wrong and that there are many strong vegans around. Body builders, swimmers, track athletes, you name it, there are vegans all around. As a competitive swimmer myself, the food that I eat before a race or a training session is very important. It needs to be full of good nutrients but something that isn’t too big that will make me sick. Here are four of my favourites! Especially before races, I always have one or two dried apricots. 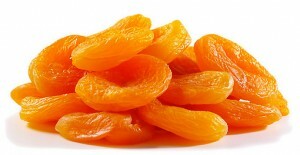 Other dried fruit favourites of mine include, banana, apples, mango and peach. They are small, you can buy them in bulk and they last quite a while. I take a small handful with me and eat some in the morning before training and then again in the afternoon before my afternoon session. I always have walnuts, pistachios or almonds on hand. Full of calcium, protein and iron, nuts are something quick and easy to eat. I just put them in a little container and chuck them in my bag for a pre/post training session. What is even better is when you make your own little trail mix! I mix nuts, fruits, dark chocolate and coconut/oats together and take it with my for after school (before swimming). It acts as a perfect afternoon snack that fills me up but doesn’t make me sick when I am training. 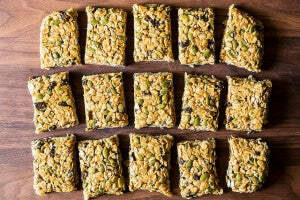 Nut bars, fruit bars, clif bars, any bar will do for me! They are bigger than nuts/dried fruit though so I only ever have half or a quarter. What is great about bars though is that one can last you a whole day or a couple of days! Not something I have often, but when I am super hungry before training I always eat either a banana or an apple! I also always pack a piece of fruit for after training between getting out of the pool and dinner so I don’t feel hungry. Hope this gives you some ideas of vegan pre/post training snacks! I am 14, live in Sydney and am the only vegan in a meat eating family. I am also a competitive swimmer (I train 5- times a week) so for me the focus on proper vegan nutrition is very important. I love to read anything from classics to non-fiction. In the future I see myself as a biologist and peace maker! Veganism is the greatest joy and life I could be living. I love to debate and promote veganism to fellow teenagers.